With the hope of adding more content and updating the "look" of our web site, Jon Miner and Sean McInerney have stepped forward to perform web master duties. As changes are made to the site you may find some errors. If you do, please report them so we can make corrections. Webmaster(s). Sunday's meeting was well attended. Bob Wilhauck showed up and gave his last Treasurer's report. The report was one of the most positive reports with the bills paid and some money in the treasury for next year. Bob has found out that with retirement he no longer has time to make it to all the meetings! Thanks Bob. If you are a member and would like to consider taking on the job of Treasurer, contact Ron Mitchell. Chris Sylvester submitted a check for donations received at this year's "Glory Day's of Railroad" event. Following the meeting, a large number of members helped cut brush and dead trees from along the North side of the tracks at Fernald Station. The cut materials were chipped with the use of a large chipper brought for the task by one of the members. Several new members and guests went for motorcar rides. This Sunday's meeting is the last meeting of the year. This means it is time to close up the engine house for the winter, patch the windows, remove the signage, we will also be cutting brush so we may expand our parking. Some of the members are bringing chain saws and a chipper. Sorry to hear that Bob W. is retiring as treasurer. He has done an excellent job. Good luck to Bob, and hope he will remain a member of the club. We will be looking for names to fill that position. I would like to thank all the members for all the hard work they have done through out the year. Hope to see everyone next Sunday. A new membership application has been created to more closely match the existing membership requirements. Click on the membership link, above. By the response I received back, most are in favor in canceling September meeting due to fuel cost. It appears that we will see prices drop back to the $2.60 range in about 4 to 6 weeks. Let's hope so any way! So this is a one-time thing. We will have our October meeting regardless. Sorry for the inconvenience. On August 14th there will be a Board of Directors meeting at 9:30am followed by our regular meeting at 10:00am. We need to discuss membership and insurance in regards to work rides. We need to replace a few ties at the engine house entrance, before trail construction starts. Trail construction has been put out to bid again, and could start in the fall. The line has not been cut this year. I received an e-mail from TRAC asking when we are going to do it. Hopefully we can get some of the work done on Sunday. If we can get a couple of jacks and spiking hammers, it would be nice. Liability insurance has been secured for the next twelve months. More good news is that no increase in premium cost to each member is expected. When you receive your insurance bill, please return payment promptly! Prior to the start of the June meeting, the tractor was used to remove track side hazards from the parking lot. Following the meeting, one new switch timber was inserted and spiked under the engine house switch and rails. One more extended length timber was inserted under the tracks connecting to the main line. This tie, and another tie inserted last year, were spiked in place but more still need to be replaced in the near future. Maybe when the weather is a bit cooler! This Saturday, May 21st, Wakefield will be holding their annual Pride Day celebration. Dave Towle has worked with Bruce Stuart, Bill Wheeler, Don Wendell, and other volunteers, including High School students, to connect the turntable to the rails. Club members are requested to bring motorcars and provide rides to the public. 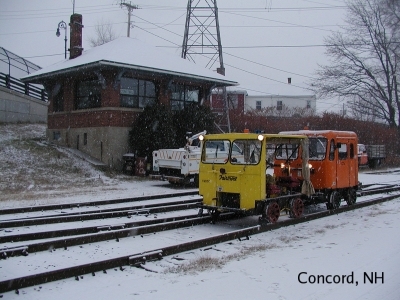 Two groups of cars will be operating between Turntable Park, in Sanbornville, and Cotton Valley siding. The first group will set on at Turntable Park before 9:30 AM and will give rides between the turntable and Route 16. The second group will set on at Fernald Station around 9:00 AM. After running east to Route 16, they will give rides between Route 16 and Cotton Valley. Following the May meeting, members cleaned up the engine house removing two dump truck loads of material. The inside of the engine house is hardly recognizable and looks great. It's time to ride the rails. Do you know where your safety flags are! The CVRTC Yahoo Group has been very active over the last two months. Over the winter, Chris Sylvester has been in contact with many railroad organizations around southern New England and you will find the events on the EVENT page. Bill McKenney is working on insurance coverage for 2005-2006. Bill has also set up a work ride for April 17th for New England Southern. Trailmaster, Bruce Stuart has been working with the NH Trails Bureau and Bureau of Railroads to ensure continued and safe use of the Wolfeboro and Ossipee rail sections bu motorcar operators. This Sunday, April 10, is the first meeting at the Fernald Engine House for 2005. Many projects are planned for this year and volunteers are wanted. The Miss Wakefield Diner on Rt16 has opened for the season. The diner will be closed on Tuesdays until mid-May. CVRTC Annual Meeting is this Sunday, March 13th at 10AM and will be at the Corner Meeting House in Belmont, NH. Directions from I- 93: Take exit 20, then Rt 140 east 4 miles to Main Street. Turn right at stop sign, Go 200 feet, and take left onto Fuller Street by the Town Hall. Go to end of street and the meeting house is on the right. Parking is in front of police station. Directions from 106. Take left at lights onto Rt 140. Go to stop sign and take a left onto Main Street. Take a left onto Fuller Street. Membership renewals were mailed out just prior to Christmas. Roy requests that each menber update your personal information and return your menbership so that he can complete as much of his membership duties prior to the annual meeting in March.